Last year, my husband and I took a week long trip to Hawaii, the islands of Hawaii and Oahu, to be exact, and we fell in love. Well, not with each other, that part was already done, with the islands. The beauty of the land, the colors of the ocean, the friendliness of the people, the magnificence of the sights and the awesomeness of Mother Nature. We couldn’t get enough of Hawaii. When we came back home, we told everyone who would listen how wonderful it was. It turns out, my husband’s mother was paying attention and decided after listening to our stories that she really wanted to go and see Hawaii for herself. She came up with the idea of having a family trip to Hawaii that included myself and my husband, both of his parents, and his sister and her husband. So, we made plans to travel to Hawaii together, to see the sights and experience the land and all she had to offer. The plan was for the rest of my husband’s family to fly into Los Angeles where we would all meet up before flying out together from Los Angeles to Hawaii. We decided that with an early morning flight to Hawaii, and with my husband’s family flying in late the evening before, we would all spend the night at an airport hotel so that we wouldn’t have to travel far to get to the airport the next day. The Westin LAX was our one night, pre-trip accommodation. Since my husband and I already live in Los Angeles, we just had to get ourselves to the airport where we would await the arrival of his family. On the evening of our stay at the hotel, we had rushed over to the hotel as soon as we were both done with work for the day. After having checked in and gotten settled, there was nothing left to do but wait for my husband’s family’s flight to arrive at LAX. Since we had some time to kill, and since neither of us had eaten, we decided to grab a meal at the hotel’s restaurant. Even though we were dining inside of a hotel, the restaurant that serviced the hotel wasn’t just your standard hotel restaurant. 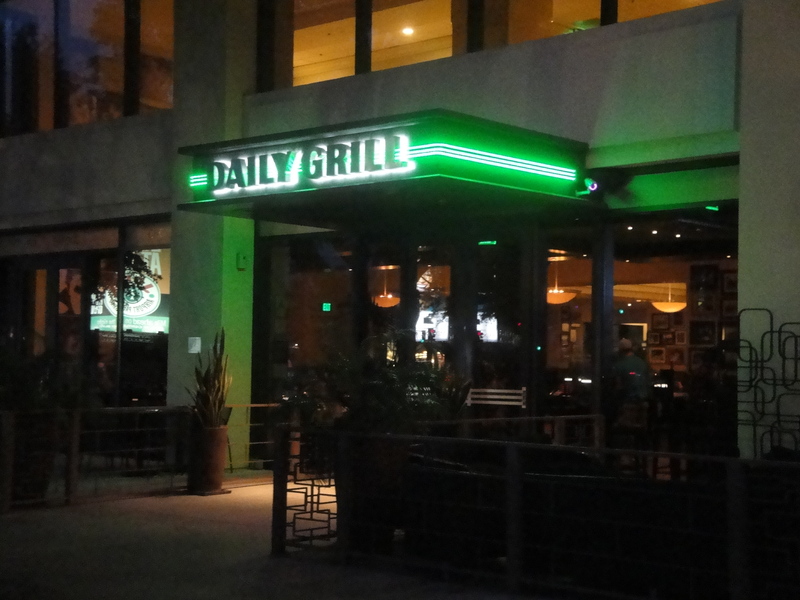 The Westin LAX featured The Daily Grill, a well-known restaurant with several locations in Southern California and throughout the country. Serving classic American fare made from scratch, the Daily Grill, as a concept, has been around since 1989. My husband and I were hungry and we were looking for hearty fare. 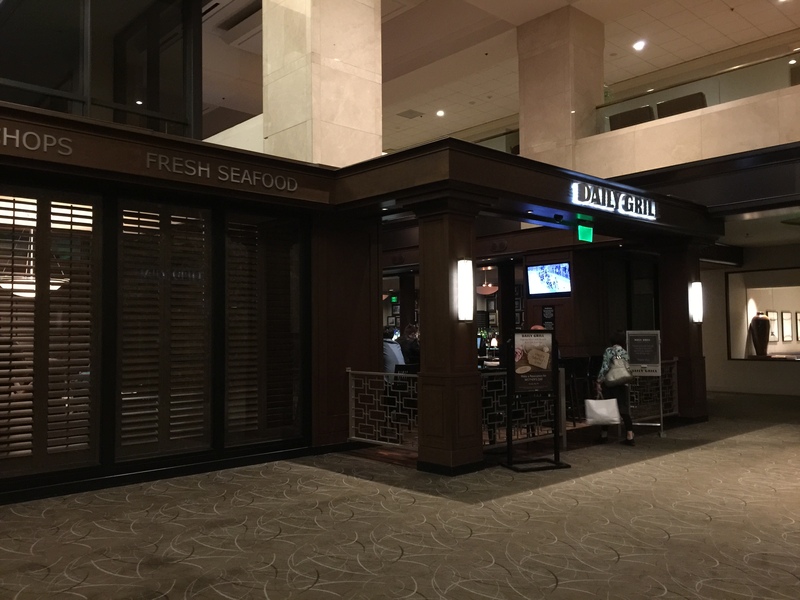 A popular restaurant, not only with hotel guests, it’s also a popular meeting spot for business meetings and with the local after-work crowd who take advantage of the restaurant’s full bar and happy hour offerings. On a Friday night, we were lucky to grab a table at the height of the evening rush. We just wanted to get a meal in before my husband’s family’s flight arrived at LAX. Strawberry lemonade sounded like a nice refreshing way to start my meal. 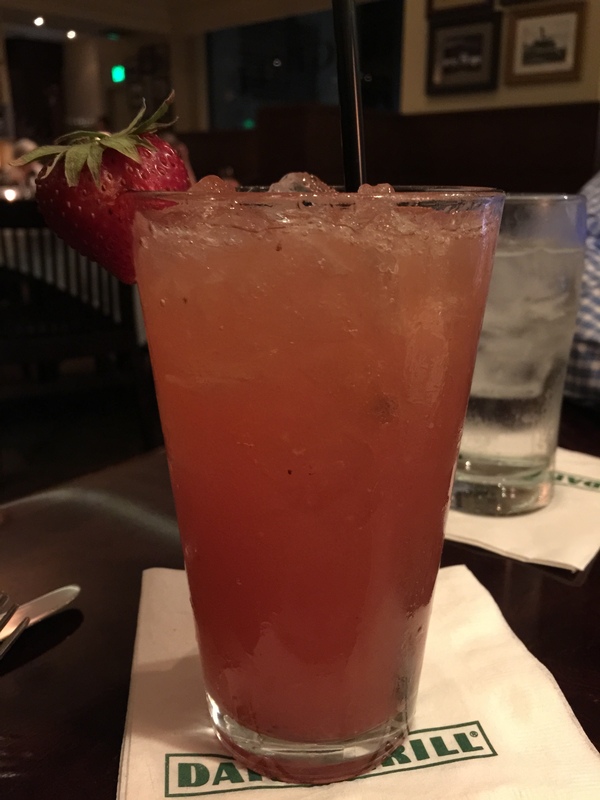 The Daily Grill says that their strawberry lemonade is fresh squeezed, and it certainly tasted like it was. The flavor of the strawberry was subtle but it sweetened the lemonade enough to balance out the tart and tang of the lemons. I also enjoyed the fact that the flavors of the sweet and the tart were balanced so much so that the drink didn’t overpower the rest of my meal, as sometimes a strong lemonade can be apt to do. Fresh, hot and crusty sourdough bread and butter showed up at the table. My husband and I were so hungry that we pretty much devoured the bread in one fell swoop. Hot out-of-the-oven bread just can’t be beat. The sourdough scent was strong and yeasty and the bread was so crusty on the outside, but light and airy and warm on the inside. My husband wanted to order the cutting board as an appetizer to start our meal. Described as the chef’s selection of cured meats and artisan cheeses, my husband couldn’t resist. Besides, we figured that meat and cheese would be light enough as to not spoil the rest of our meal. 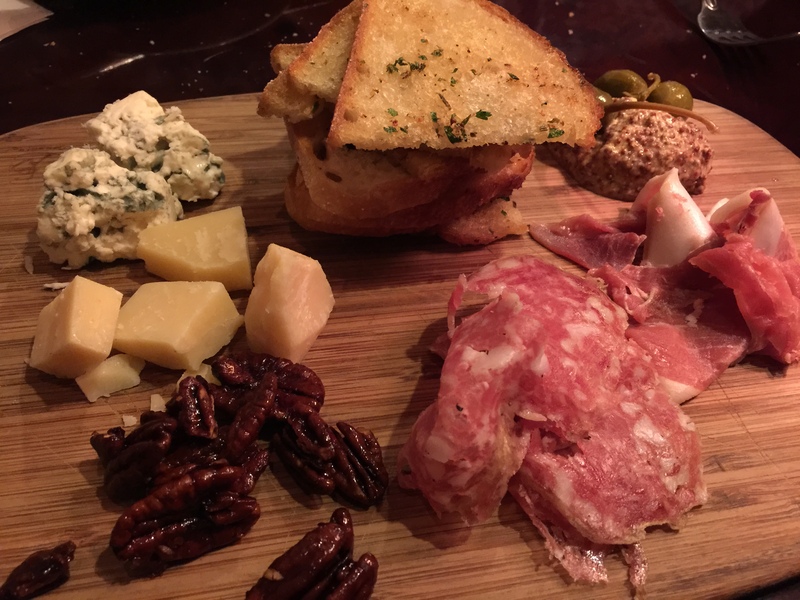 The cutting board was actually served on a cutting board, which was a nice touch, and came with some toasted bread, candied walnuts, whole grain mustard and coronations, prosciutto, thin-sliced salami, blue cheese, and sharp white cheddar. 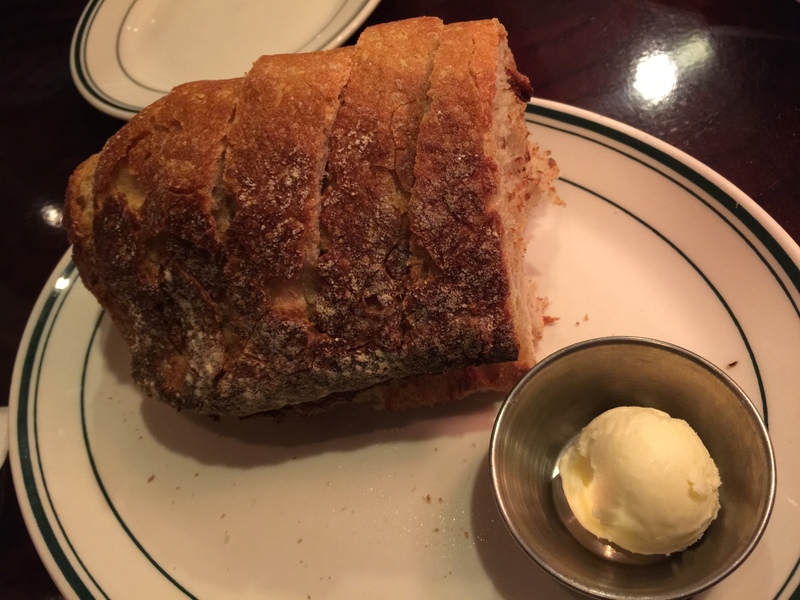 I really enjoyed the bread, which I found to be quite tasty with some sort of garlic butter spread. My husband really enjoyed the blue cheese whereas I liked the white cheddar which I felt had aged nicely. It’s hard to not like salami and prosciutto. And surprisingly, I enjoyed the candied walnuts which I think added the perfect crunch and sweetness to the cutting board. For his meal, my husband ordered a prix fixe, three-course meal that offered the choice of soup or salad, a choice of entrée, and a choice of dessert. The price was fantastic, and for what he received, the value was terrific. 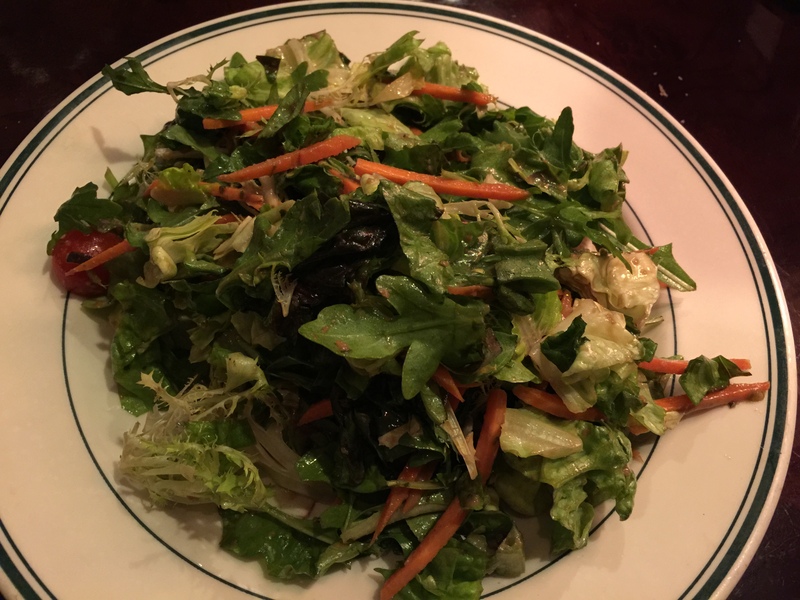 My husband’s meal started out with a simple mixed green salad with carrots, cherry tomatoes and croutons all dressed with balsamic vinaigrette. Nothing flashy and amazing, but a pretty good size for a salad starter. My entrée was braised short rib. 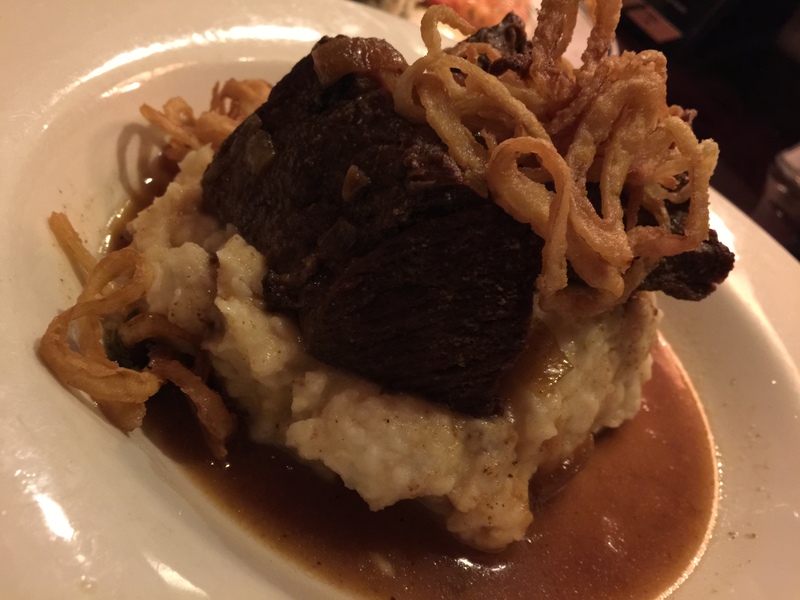 Boneless short rib served with horseradish mashed potatoes and caramelized onion au jus sounded intriguing to me and I’ve always been a fan of short ribs. First off, the braised short rib itself was outstanding. Braised long enough to be incredibly tender that the touch of a fork and the short rib pretty much fell apart. The flavor of the short rib was terrific and there was double the amount of meat on the plate than I had expected. The caramelized onion au jus was fantastic and added a great depth of flavor to not only the short ribs but the horseradish mashed potatoes as well. I also thought that the addition of the crispy onion strings gave the dish the perfect amount of crunch and texture contrast to offset the tender meat and the soft mashed potatoes. Now, the horseradish mashed potatoes sounded most interesting and they tasted amazing. If you like the hot, spicy bite of horseradish, then these mashed potatoes would be for you. They were strong, and a few bites and my sinuses cleared right up. These were certainly not mashed potatoes for the faint of heart, but the strong bite of the horseradish was cooled a bit by the delicious caramelized onion au jus. If I was looking for a hearty meal, this was exactly what I was looking for. For his starter, my husband chose the filet mignon & shrimp. 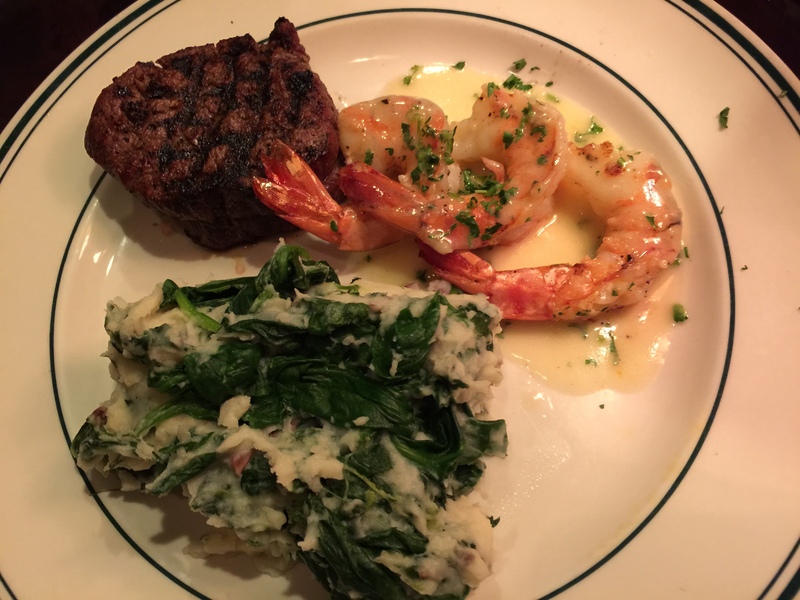 The menu described the dish as pan seared shrimp with garlic sauce and a filet mignon cooked to your preferred done-ness served alongside spinach mashed potatoes. My husband found the filet mignon to be tender and flavorful and cooked exactly as he had ordered it. He thought the meat had great char on it from the grill and that added great flavor. However, for him, the star of the dish was the pan seared shrimp. After one bite, my husband told me I had to try one of his shrimp because they were so good. I couldn’t deny how wonderful they tasted. Cooked in a terrific garlic sauce, the shrimp were buttery and tender and full of garlic and lemon flavor. My husband said it reminded him a bit of the garlic shrimp we were on our way to enjoy in Hawaii. The spinach mashed potatoes were almost an after thought on my husband’s dish, but after he had one bite of the potatoes he raved over how delicious the spinach mashed potatoes were. All in all, my husband had a delicious meal that he was more than pleased with. The dessert choice that my husband picked was strawberry shortcake. We had assumed that the dessert that came with the meal would be a small, single-serving desert. We were quite surprised with the large size of the strawberry shortcake that was delivered to the table. 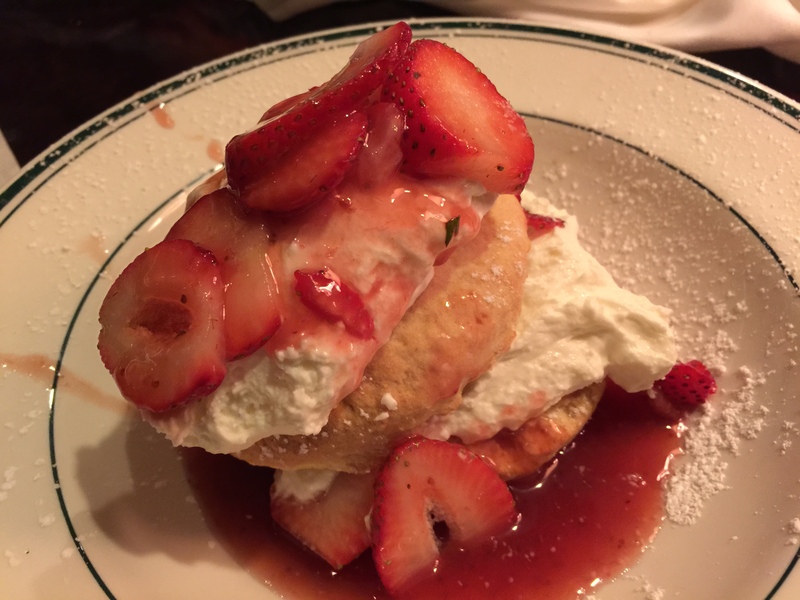 Sliced fresh strawberries topped over a homemade biscuit with strawberry sauce and homemade whipped cream was how the menu described the dessert. The homemade biscuit was terrific, golden brown on the outside with a thick, but airy inside with just a hint of sweetness. The strawberry sauce and the fresh sliced strawberries were subtly sweet, which was good, so that the sauce didn’t overpower everything with sugary sweetness. Finally, the whipped cream with just a touch of sweetness to it, rounded everything out perfectly. this was a terrific ending to our meal. And perfect timing as well as my husband’s family arrived at the airport just as we were finishing up our dessert. Walking into the Daily Grill, we didn’t quite know what to expect. It was, after all, an airport hotel restaurant, even though it was a well-known chain restaurant. 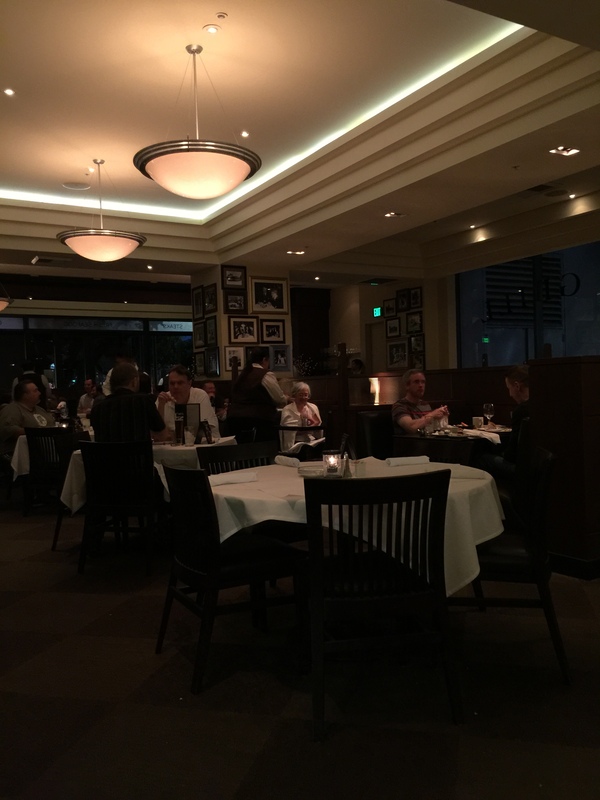 What we got in terms of quality and taste of food was much more than we had expected. My husband even said that he was “thoroughly amazed by the quality of the meal.” The food was hearty, delicious, made-from-scratch American classics, just as advertised. Having not eaten anything all day, we were looking for a filling meal, and we surely walked out of the Daily Grill stuffed and satiated. A full night’s rest on the menu, and we’d be ready the next day for our flight to Hawaii.